You want the results that social media can bring, but you don’t want to go crazy trying to keep up with ALL. THE. PLATFORMS. I hear you! There are so many different places to “show up” these days that it can get seriously overwhelming! 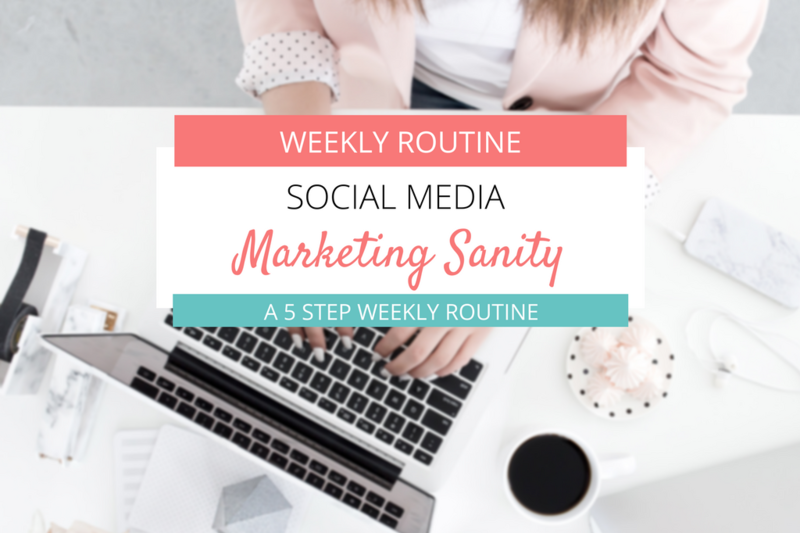 If you’re struggling to stay on top of social media and actually use it as a tool (instead of letting it use you), then implementing a weekly routine can make a huge difference in the results you see and the amount of energy spend. Social media is a powerful tool for business growth — plus, who doesn’t love free advertising? If you’re looking to grow your audience, reach more potential customers, and ultimately make more sales, then you’ve probably at least dabbled in promoting yourself on a few of the different social media platforms. But if your business is like most, you probably didn’t see any instant results. In fact, you may not have received any return on your invested time at all, yet. Does that mean social media marketing doesn’t work? Of course not. It just means that you need to be in it for the long game if you really expect to see results. The struggle, of course, is that social media can be incredibly time-consuming, making it difficult to stay consistent when things get busy. It’s also so easy to waste time on less important efforts that are never going to give you a good ROI. A weekly routine for your social media marketing efforts can help you stay on track (focused on what works) and stay consistent month after month. Here are five steps for creating an effective weekly routine that will create better results and restore your sanity. In other words: we should focus on what works! What platform drives the most traffic to your website? Which allows you to best connect with potential clients? On which do you have the easiest time attracting an engaged audience? Look at what’s working for others. Check out other leaders in your industry. Where are most of their clients/sales coming from? What type of posts seem to most resonate with their audiences? Which platforms are working best for them? Timing is one of the main factors of consistency. When will you show up where? Design a plan of when you’ll post on each platform. For best results, choose just one platform to be your primary channel that you focus most of your energy on, and 2 – 3 other platforms to act as a support network. For example, you might choose Youtube to be your primary platform, and Instagram and Facebook as support platforms. In that case, you’d likely publish your best/biggest content on Youtube (perhaps once/week), and then post snippets, quotes, and promotional content on Facebook and Instagram each day. In the above example, you’d be promoting your Youtube channel to your audiences on Instagram and Facebook. In this way, you’d be able to grow your main audience (on Youtube) exponentially larger than you otherwise would. This can help to direct your customers into your sales funnel and to develop a stronger relationship with them. Once you’ve decided where you’ll be posting and when, you’ll know how much content (and what type of content) you need to create each week. When will you create all this content? Well, most people find it easier to write in batches — a whole bunch all at once. This is because it takes a little while to get into the “flow” of writing/creating, and once you get into the “flow” you’re able to create more quickly and easily. So rather than trying to create original content every day (when you’re on a “deadline”), instead choose one day, either each week, every two weeks, or every month, and create all of your social media content at once. If you’ve never tried “batching” your content before, then it might sound daunting to create so much content at once. I’d suggest that you give it a try. 🙂 I think you’ll be pleasantly surprised at how much easier it is! As you probably know, there are a number of different tools that allow you to schedule your posts to publish automatically at future times. This allows you to get it all done in just one session, saving you lots of time during the week! Some of my favorite social media schedulers are Edgar, Buffer, Hootsuite, and Postcron. Each of these tools works slightly differently and provides different features, so be sure to check each of them out (and maybe sign up for their free trials!) before you choose one to go steady with. Once you’ve selected a publishing platform, choose one day each week to “set and forget” all your posts. You’ll be amazed at how much time this frees up during the week! Engagement (likes, comments, etc), is the primary metric that ALL social media platform algorithms use to determine the “quality” of content. In other words, the more people interact with your posts, the more people will see your posts! It’s in the best interest of Facebook, Instagram, and all the platforms to KEEP users in their apps as long as possible — and they do this by showing people content that is most likely to be interesting and engaging. All this to say: engagement is crucial for your social media accounts to grow. That means that some of the most important parts of your social media routine should be replying to comments on your posts, commenting on the posts of other people in your industry, and sharing such content. But as a busy entrepreneur, I’m sure you know that this won’t happen on its own. Just like any other task, the only way you’re actually going to “find” time to engage on social media is if you make time. So put it on your calendar! Seriously — it’s that important. Choose 3 – 4 days/week to spend 10 – 30 minutes simply connecting with people on social media, talking about their questions and feelings that relate to your niche. Don’t let social media take over your life! While the results social media marketing can bring are potentially great, they aren’t worth spending hours and hours of each day over. Instead, use the guidelines above to create a social media marketing routine that will allow you to achieve 80% of the results in 20% of the time. Gillian Perkins is a business marketing strategist, entrepreneur, and #1 internationally bestselling author. She helps entrepreneurs grow their online businesses bigger and stronger by designing and implementing strategic marketing plans. Visit Gillian’s website at www.gillianperkins.com to learn more about how to grow your audience and make more sales. You can also find her on Facebook, Instagram, and Twitter. Gillian lives in beautiful, green Oregon with her husband and two little boys, where she loves to eat delicious, healthy food, read #allthebooks, and obsess over coffee with friends.